On November the 7th you are invited to Smart City Hub #5 where innovative Smart City ideas are generated and new contacts are created across students, businesses, researchers and municipalities. TDC Business Lab and TDC Digital will be presenting cases under the theme ‘IoT, Smart City and AI’, where you as a participant will work with the question: How can Artificial Intelligence (AI) better utilize existing data and create new solutions in the smart city? ‘Smart City Hub’ is a physical place that creates cooperation, meetings and solutions across students, businesses, researchers and municipalities all working with urban planning, data and soft- & hardware on a technical and/or at business level. The hub will be facilitated by experts and a relevant Smart City-theme such as supply, buildings, planning or mobility will be discussed as a theme at the hub. 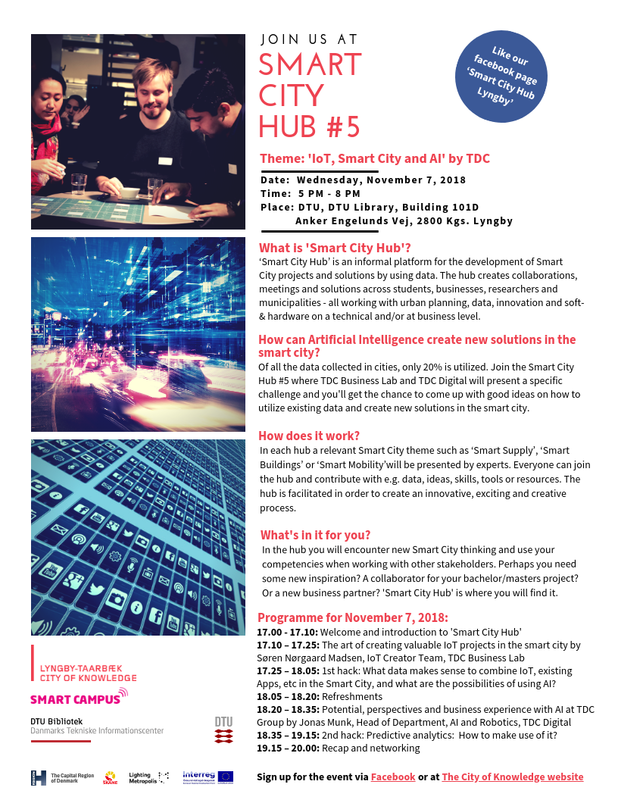 Smart City Hub #5 will take place on November 7th from 5-8 PM at DTU Library. The hub will be held in english and facilitated by Finn Kollerup. Share the event and sign up for the event via the form below. ‘Smart City Hub’ is a collaboration between The City of Knowledge (Vidensby) and DTU. Since January 2018 ‘Smart City Hub’ has been financed by Lighting Metropolis.